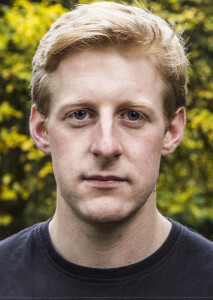 A Belfast native, Michael trained at Mountview Academy of Theatre Arts in London after studying science at the University of Cambridge, where he performed with the famous Cambridge Footlights. His recent Irish theatre credits include Joe Dowling’s OTHELLO (The Abbey Theatre), Wayne Jordan’s RADAMISTO (NI Opera), BLACKOUT, (The Lyric Theatre),THE COMPLETE WORKS OF WILLIAM SHAKESPEARE ABRIDGED and THE IMPORTANCE OF BEING EARNEST (Bruiser NI). In September 2017 Michael wrote and performed the one man play MY LEFT NUT which he developed through the ‘Show in a Bag’ programme with Fishamble, The Irish Theatre Institute and The Dublin Fringe Festival. The show was a great success, with 4 stars from both The Irish Times and The Sunday Times “laughing one minute, crying the next… a terrific performance of a touching story.” My Left Nut was nominated for the best show under an hour at the Dublin Fringe Awards and Michael hopes to tour it soon. His TV and film credits include SOFT BORDER PATROL, a new semi-improvised comedy series for BBC NI, GAME OF THRONES (TV – HBO), TRAUTMANN (Feature – Zephyr Films) and THE BLACK WEDDING (short – Montoya Productions). Michael also enjoys voice acting and his radio credits include HIDING OUT (BBC Radio 4), LOUIS MACNEICE MEMORIAL LECTURE (BBC NI), RESISTANCE RADIO and WARM UP ACT (Roundhouse Radio) as well as voice over work for Alain de Botton’s School of Life Videos.